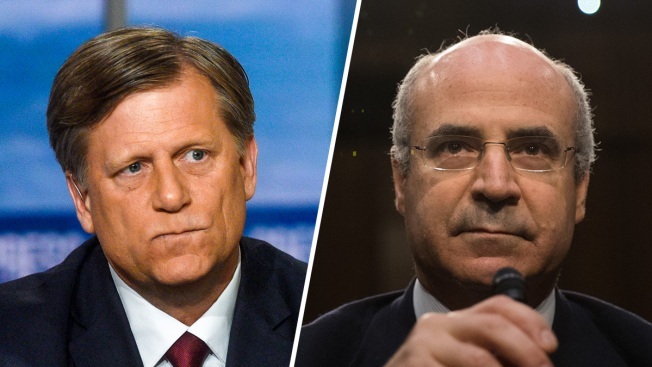 Michael McFaul, left, and Bill Browder. The White House and the State Department are at odds over Russian President Vladimir Putin's offer to allow the U.S. access to Russians accused of election meddling in return for interviews of Americans accused by the Kremlin of unspecified crimes. Even as the White House said the offer, made by Putin to President Donald Trump at their summit in Helsinki on Monday, was under consideration, the State Department called Russia's allegations against the Americans "absurd," suggesting that any questioning of them would not be countenanced by the U.S. The Russian claims against the Americans, including former U.S. Ambassador to Russia Michael McFaul, relate to allegations of fraud and corruption. "The overall assertions that have come out of the Russian government are absolutely absurd: the fact that they want to question 11 American citizens and the assertions that the Russian government is making about those American citizens," spokeswoman Heather Nauert told reporters. McFaul tweeted Wednesday: "I hope the White House corrects the record and denounces in categorical terms this ridiculous request from Putin. Not doing so creates moral equivalency between a legitimacy US indictment of Russian intelligence officers and a crazy, completely fabricated story invented by Putin." Nauert noted that a U.S. federal court had already rejected Russia's charges regarding British businessman and vocal Kremlin critic Bill Browder. She said Russian authorities already know the U.S. position. Browder was a driving force behind a U.S. law targeting Russian officials over human rights abuses. "We do not stand by those assertions that the Russian government makes," Nauert said. "The Prosecutor General in Russia is well aware that the United States has rejected Russian allegations in this regard. ... We continue to urge Russian authorities to work with the U.S. Department of Justice to pursue those in Russia who in fact perpetrated the fraudulent scheme that Russia refers to that targeted not only Mr. Browder, but also his company and ... the Russian people as a whole." FBI Director Christopher Wray was similarly dismissive. Speaking Wednesday at the Aspen Security Forum in Colorado, he said Putin's offer was "not high on our list of investigative techniques." Wray and Nauert's comments stood in sharp contrast to those of White House press secretary Sarah Huckabee Sanders, who held open the possibility that what Trump called "an incredible offer" is being weighed. "The president's going to meet with his team, and we'll let you know when we have an announcement on that," she said, adding that neither Trump nor anyone else in the administration had committed to accepting the offer.